Reliance Jio chief Mukesh Ambani announced at the company’s Annual General Meeting on 21 July 2017, a VoLTE handset introduced as “India ka Smartphone” and it effective price of rupees zero (buyers will have to shell out a refundable, security deposit of rupees 1500 for the smartphone). Jio LYF 4G feature phones come preloaded with Reliance Jio apps like my Jio, Jio express news, Jio chat, Jionet Hotspot, and others. 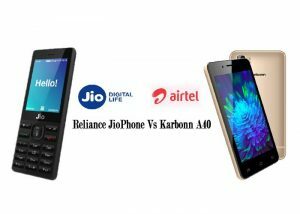 Airtel in collaboration with Karbonn has launched the Karbonn A40 and Airtel is offering the new handset at an effective price of rupees 1,399 while the actual price of the handset is around rupees 3,500. The smartphone will be sold to consumers for a down payment of rupees 2,899, on which Airtel will give cash back of rupees 1,500 over three years on the condition. The smartphone has dual-SIM phone supports 4G VoLTE as well as Bluetooth, Wi-Fi b/g/n, and FM radio. However, USB-OTG isn’t supported and neither is GPS. Features Yes, Torch, Connect Import via Gmail Camera flash allows you to take photos in low light.